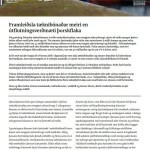 Tíu tæknifyrirtæki í sjávarútvegi hafa tekið höndum saman um að kynna tæknilausnir á alþjóðamarkaði sem eru framúrskarandi í grænni tækni og stuðla að bættu umhverfi. Tæknilausnir fyrirtækjanna byggja á betri nýtingu orkugjafa, minni olíunotkun búnaðar, betri nýtingu í vinnslu hráefna, o.s.frv. 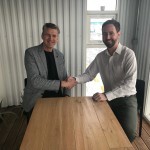 Unnið hefur verið að þessu verkefni í á annað ár en með því er ætlunin að efla samstarf tæknifyrirtækja um að kynna framúrskarandi íslenska tækni fyrir alþjóðlegan sjávarútveg og vinnslu. 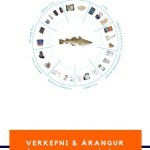 Um leið er með verkefninu vakin athygli á forystu íslensks sjávarútvegs í gæðum, veiðum og vinnslu. 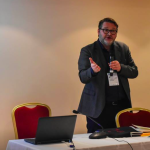 Unnið hefur verið að gerð sérstaks korts sem sýnir hvernig þessi tækni nýtist sjávarútvegi um allan heim og umhverfinu. Hönnuðir eru Darri Úlfsson og fyrirtækið Borgarmynd. 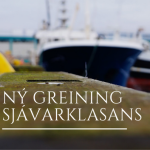 Í morgun var opnuð sérstök vefsíða, www.greenmarinetechnology.is, sem kynnir þessi fyrirtæki og þá tækni sem þau bjóða. 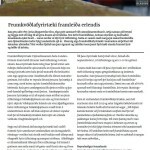 Verkefnið er afrakstur samstarfs tæknifyrirtækja innan Íslenska sjávarklasans en að því standa 3X Technology, Dis, Marport, Naust Marine, Navis, Pólar togbúnaður, Prómens, Samey, ThorIce og Trefjar. Ten technology firms in fisheries are working together on introducing technological solutions world wide that excel in green technology and at the same time contribute to environmental improvements..The solutions are based on better energy utilization, less oil consumption of machinery, better utilization of materials etc. 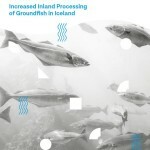 This has been a work in progress for the past 18 months and the aim is to strengthen cooperation among technology firms and introduce excellent Icelandic technology for world wide fisheries and processing. A special map has been created which shows how the technology is used in fisheries around the world. The Designer of the map is Darri Úlfsson and the company Borgarmynd. The website, www.greenmarinetechnology.is, which was formally introduced this morning, shows the companies profiles and the solutions they have to offer. 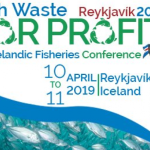 The project is a result of cooperation among the following technology firms within the Iceland Ocean Cluster: 3X Technology, Dis, Marport, Naust Marine, Navis, Pólar togbúnaður, Prómens, Samey, ThorIce og Trefjar.